Say "checkers" and what image does that conjure up? Very likely it's something like a couple of old geezers on a park bench; some hillbillies in a country store playing on top of a cracker-barrel; or possibly a dad and a kid in a vacation scene. 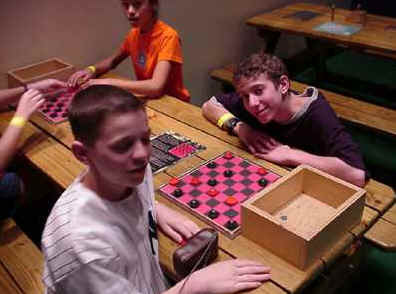 In any event, the board is folding cardboard with black and red squares separated by a yellow line; the pieces are black and red plastic (maybe wood in the hillbilly scene); and there is this look of intense concentration when suddenly one kid (or geezer or hillbilly) says to the other, "Ya gotta jump um." 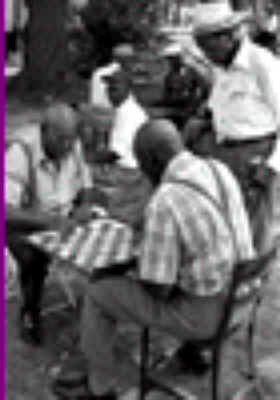 This all goes to prove that checkers is a great game, a game that anyone and everyone can enjoy. But there's more here than meets the eye and a lot more than you might have ever thought. Checkers in its full realized potential, "scientific checkers" as it is often called, ranks among the best intellectual challenges and requires years or decades to fully master, if that can even be done. Checkers is denigrated these days, thought of as easy and old-fashioned, played by people who can't grasp chess. You'll find checkers sneeringly referred to as "country chess" and "chess for the rest of us." Game manufacturers don't even market regulation checkers equipment any longer; most checker sets today are found in the toy section, probably next to the beach balls. Mention checkers at the office, as I recently did, and you'll get a funny "you can't be serious" look. This is a shame, and it's all wrong. This viewpoint combines a lack of respect for the common man with a misplaced elitism and an unhealthy dose of ignorance. There is little that is more serious than serious checkers. Stick with me for a few more paragraphs and you'll be quickly convinced. I play "serious" or "scientific" checkers. I'm not especially good at it, yet, but I've learned enough to know how much more I've got to learn. No doubt, checkers is a great game for kids and a great recreation for anyone, but there's a whole 'nother world of checkers out there. I once played chess seriously, with middling ability; I've learned a little Xiangqi (Chinese Chess) and Go. These are games of great depth and, in the case of Go, often unusual beauty. So why I am learning about serious checkers? Almost by accident, while looking for books about Go at a local store, I came across "Play Winning Checkers" by Robert Pike. I bought the book and started to read it through. 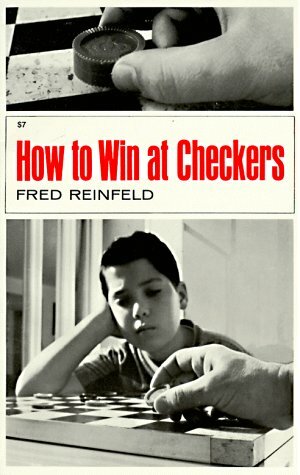 Now, if you want to play "winning" checkers this is not exactly the best book (I make recommendations here), but if you want to learn about checkers as a serious game, this book will convince you and win you over. It surely did with me. This little book has probably done more good ambassadorship for checkers than any other book in recent times. In the book, you will learn about the greatest checkers master of all time, Dr. Marion Tinsley, and you will learn all about this business of "scientific" checkers. I went away convinced that checkers is as deep a game as chess, but with the appeal of familiarity and simplicity of concept. You can learn the rules in a few minutes, but real expertise takes many years of study. I've concluded that to a great extent the simplicity of the game system drives the complexity of game play. There are only two types of piece and one type of move and capture. This makes the game deeper rather than wider. It makes the game accessible to all but mastered by few. If you think checkers is just moving pieces around waiting for the other guy to make a mistake, get on the internet and do a little research. 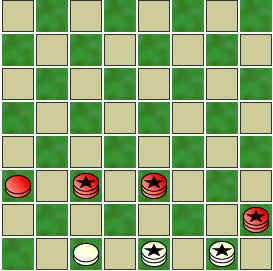 Then try a game against an expert player or a strong computer program (I recommend a some here), and you'll see what checkers is all about. Checkers opening theory is every bit as well developed as chess opening theory. Given that there are fewer opening lines in checkers, the depth of research probably is greater. However, this initially works to one's advantage: with fewer lines to study, the beginner can at least get an idea of what to do in most situations in a relatively brief time. But true mastery of checker openings is a long, hard road. Then there is checkers endgame theory, which I find as deep and complex as chess endgame theory. There are a number of "basic" positions to be learned. Here if you play against a high grade computer program you're at quite a disadvantage, because there are databases of endings with up to eight pieces on the board. Checker endgames are often elegant and delicate, requiring great powers of visualization. 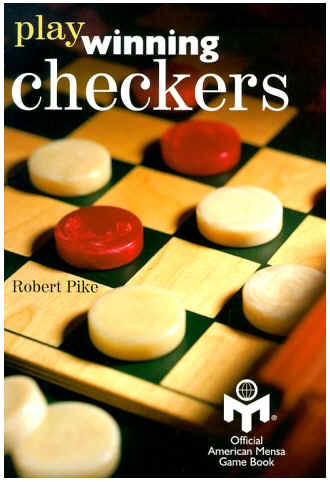 Indeed, checkers grandmaster and author Richard Pask has referred to checkers as a "most subtle game." Don't neglect this under-rated and under-appreciated game. Get a real checker set (see companion page), and then buy a few books. 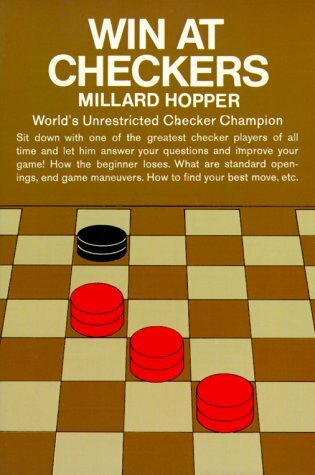 For a beginner, I like Millard Hopper's book, Play Winning Checkers, Fred Reinfeld's book, How to Win at Checkers, and especially Richard Pask's Starting Out in Checkers. You can get these books from your favorite online source, or even better, order them at your local full-service bookstore. I've reviewed numerous books and make additional recommendations on my book review page. 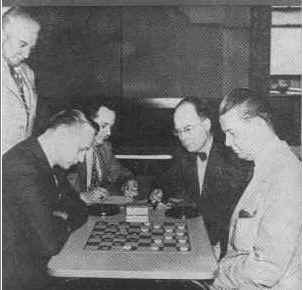 You can find many other sources of information and checkers links on Jim Loy's wonderful and very complete checkers site, http://www.jimloy.com/checkers/checkers.htm . I've written some of my own advice for beginners and the American Checker Federation, at http://www.usacheckers.com has excellent tutoral essays written by master players. Then you need to play a lot. You'll find quite a few on-line places to play. You can always get a game at http://games.yahoo.com or http://zone.msn.com , as well as a number of other locations. I've separately listed and rated dozens of on-line sites at checkersites.html . Get a new perspective on a challenging game that has stood the test of time, and see what you think. But ya still gotta jump um. Bob Newell, Santa Fe, New Mexico. Last revised 6 March 2005.